Yesterday was another good day for me! I won a Round Robin 3 out of 3 to go up +8.4 units overall for the day. Yesterday, I once again put his money where my mouth is by betting a total of more than $50,000 on my own picks, and ended up cashing out close to $60,000. 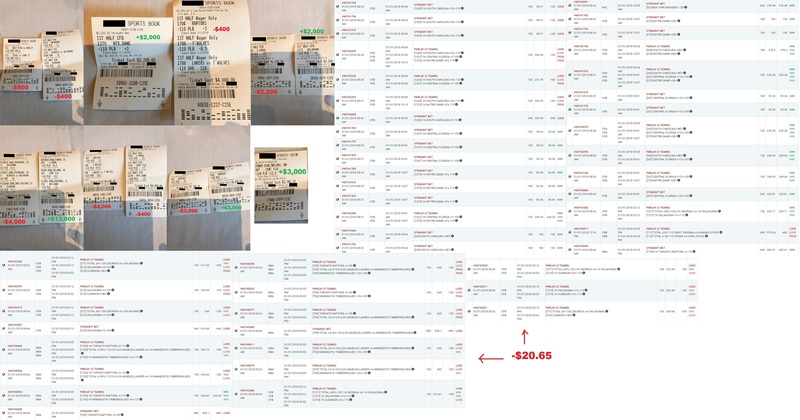 Take a look at the included attachment of this email and see for yourself all of my betting tickets yesterday totaling $50,660, and my net winnings of $8,879.35 – all in one single day of betting on sports. Yesterday on Monday January 1st, I wagered $50,660 and cashed out $59,539.35 for a profit of $8,879.35. 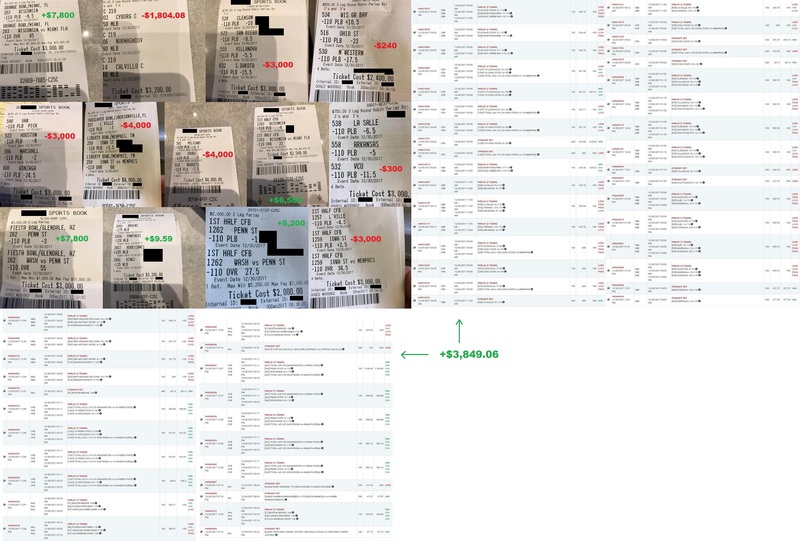 The day before on Sunday December 31st, I wagered $44,660 and cashed out $76,128 for a net profit of $31,468.29. The day before that on Saturday December 30th, I wagered $48,730 today and cashed out $60,544.57 for a profit of $11,814.57. And you’ve literally seen it happened with your own eyes. In 3 short days, I risked nearly $150,000 of my own money on my picks, and ended up walking away with $43,282.57 in profits. That’s the kind of money that many people make in an entire year working full-time. I made it in just 3 days of betting on sports. And if you’ve been following me and betting on the same picks I did, then you, too, would’ve probably made a nice fortune. Let that sink in for a minute. By betting on my picks, Pelle won $35,000 in one single day, and finally became debt-free for the first time in 21 years. Here’s the full recap of my results for 2017, all documented on The Whale Tracker. Since the release of The Tracker to document all of my picks and results, I’m up a total of +64.13 units on the Round Robins for 2017 and up +8.4 units so far for 2018. And if you also wagered on my straight bets and best bets, then you’d be up hundreds of additional units. The reason why I document all of my picks on The Whale Tracker is because I want to show you how these picks end up ahead over time. I don’t win the conventional way. A large part of the $30+ million dollars I won from betting on sports is based off different riding waves of pattern recognition in sports to make millions of dollars – that quick. But during ride, there are bumps along the way. Winning a Round Robin is statistically unlikely because you’d have to win a majority or all of the bets in the Round Robin group in order to profit. So you actually see more Round Robins lose than they win. But this is key: my approach to winning millions is very similar to how the elite poker players make their millions. Elite poker players have more losing hands than winning hands. The key is that on their winning hands, they tend to take over the table and win the entire pot. Every time a Round Robin falls, it’s just as if you’re folding a bad hand in poker. But as soon as the waves are smooth and the patterns begin to form, you’ll see me The Whale win one Round Robin after another after another and skyrocket way up in winnings. You’ve seen it happened for yourself. In the last 3 days I’ve cashed out nearly $200,000. And in just one single day, one customer won $35,000 and is now debt-free for the first time in 21 years. That’s an example of what can happen once the patterns form and I get hot. Plus, when you are tailing me, you know that you have someone who has skin in the game with you. That’s the biggest differentiation you’ll see with me compared to any other tout who are out to make money from selling their picks. I’ve made my millions not from selling my picks, but from betting on them. In the last 3 days, I’ve put up nearly $150,000 of my own money at risk on my picks. Know of any tout out there who has risked $150,000 of their own money on their picks in the last 3 days? They don’t exist. Touts are out to make money from selling their picks. I’m here to show you that I make money from betting on my picks. Just like in the last 3 days where I have profited more than $43,000. I’m willing to put my money where my mouth is because I know that I’m going to end up ahead. It’s happened for me for 30 years. Plus, by risking hundreds of thousands of dollars betting on my picks every single week, you now can be absolutely certain that the only way for me to win with this program is when I can help you win, too. I have hundreds of thousands of dollars on the line on these same picks I’m sharing with you, so I cannot possibly win unless you’re also winning. The only reason why I continue to spend hours of my time handicapping sports each day and betting hundreds of thousands to millions of dollars each month on my picks is because I’m 100% convinced that I will win out. Nobody risks this kind of money day in and day out unless they feel certain about winning. Either that or they’re absolutely nuts.